Two-fluid atomization, which is commonly used for the production of fine metal powders, uses air, water, oil, or an inert gas to cause liquids or molten metals to separate into small particles. Operators can independently control the fluid pressure levels to enable more precise application. Two-fluid atomizers or spray devices are also used in fire suppression systems that use a high pressure water and a compressed gas to produce a mist of atomized water. Pressure atomization, like that found in jet propulsion or injection of fuel oil sprays into steam boilers, uses high pressure to force a fluid through a nozzle designed to disperse the liquid. This type of atomization is also used to spray chemicals such as insecticides and herbicides on crops or to wash fruits and vegetables before packaging. Water sprays are also used to control dust production in mining, wash gravel, coat paper, or control acid gas and particulate emissions in power plant cooling towers. In centrifugal atomization, the fluid is introduced at the center of a spinning disk or electrode where centrifugal force carries fluid to the edge and accelerates it to promote instabilities that evolve into droplets. 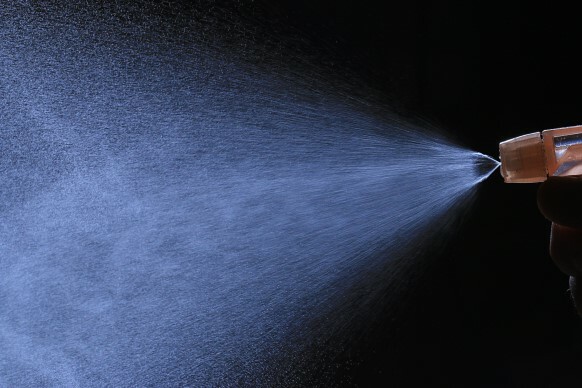 Operators typically induce an electrostatic charge to the spray to ensure droplets are applied only to the grounded target material. Electrostatic atomization relies on an electric field between a charged atomizer and a grounded workpiece to break the fluid into droplets and propel those droplets onto an application surface. Ultrasonic atomization uses high-frequency vibrations to split fluids into fine droplets. This type of application is often used to dry liquids, like powdered milk; it is also used in medical nebulizers where precise control of the speed of the fluid, velocity of the air, and the vibrational frequency are essential to the desired quality and features of the product. Improved understanding of viscosity and surface tension could enhance the uniformity and distribution size of spray droplets to reduce the amount of insecticide, herbicide, and fertilizer applied to crops. High-fidelity numerical simulations, conducted at high-performance computing (HPC) facilities, could elucidate the underlying physics of mixing air and fuel droplets in turbine combustion, thereby helping to improve the efficiency of jet engines. Advanced imaging and X-Ray techniques can help researchers construct physics-based process models to more accurately predict and control the powder quality of atomized metals, which in turn could enhance the viability of additive manufacturing technologies for increasingly demanding applications in the automotive, aerospace, and defense sectors. Before the Advanced Manufacturing Technology Consortia Program (AMTech) merged into the Manufacturing USA program, Nexight Group supported the Atomization Technology Innovation Consortium (ATIC) in the development of an advanced technology roadmap to help support the growth and competitiveness of the broad atomization community. Atomization is one of several key manufacturing technologies that are foundational to the economic and national security of the United States. Today, Nexight Group continues to provide technology roadmapping, strategic planning, and workforce development support to several of the 14 institutes in the Manufacturing USA network in their quest to bridge the gap between research and commercialization of advanced manufacturing technologies while reducing the inherent risk and uncertainty of innovative R&D.